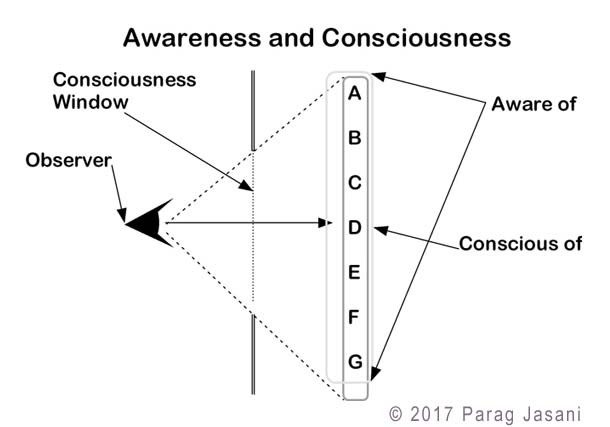 What is the difference between awareness and consciousness? Question: Are you aware or are you conscious you are reading this? The answer is, while reading this; you are both aware and conscious that you are reading it. Out of all the items you are aware of, you are conscious of the one you are attending to. In the t-shirt analogy (on previous page), the stock of t-shirts spread out on the table is what one is aware of and the t-shirt being attended to is what one is conscious of. In the DOS model, the information linked to the awareness buffer is what one is aware of and the information that is being processed by VP is what one is conscious of. How is it that one can be aware of many things, but can attend to only one at a time? Even when the brain can attend to only one task at a time, one can be aware of many things because it seems that all information that one is aware of is available simultaneously. The reason for the same is that, thanks to ease of access provided by the awareness buffer, switching of information linked to it happens without any delay, offering the effect of what is known as "refrigerator light phenomenon". The refrigerator light phenomenon is the feeling of refrigerator light being always on, even when its door is closed, which is when a limit switch turns it off. The effect it produces is like when communicating with a group of people, you switch from one person to the other, while all of them are available for communication as and when needed, giving the effect of simultaneity. E.g. when you are sitting on a chair and talking to someone on the phone, the information related to the subject of your conversation, nature of the person on the other side, his intentions, etc. and the pressure of your body weight against the chair, its balance, weight of the handset, etc. is linked to the awareness buffer, so your attention can drift between them easily as and when required (more under title Attention Mechanism). Detailed explanation under title Awareness. Note: This minisite, along with other minisites like FreeWillExplained.com, ConsciousnessExplained.com, ThinkingExplained.com, Brainduality.com, LanguageExplained.com and DOSModel.com, are designed to explain unresolved phenomena related to the human mind and brain in a simplified manner. They are not full explanations. To understand mechanisms that are responsible for such phenomena, you need to go through their detailed explanations by following the links provided. To understand the development of such mechanisms in a step-by-step manner, you need to visit the website WhatisMind.com. © 2017 Parag Jasani. All Rights Reserved.